Our objective: To develop ways to produce, at scale, widely affordable, advanced biofuels for transportation and industrial applications. Use of fossil fuels in transportation and industrial production contributes up to 35% of global greenhouse gas (GHG) emissions. 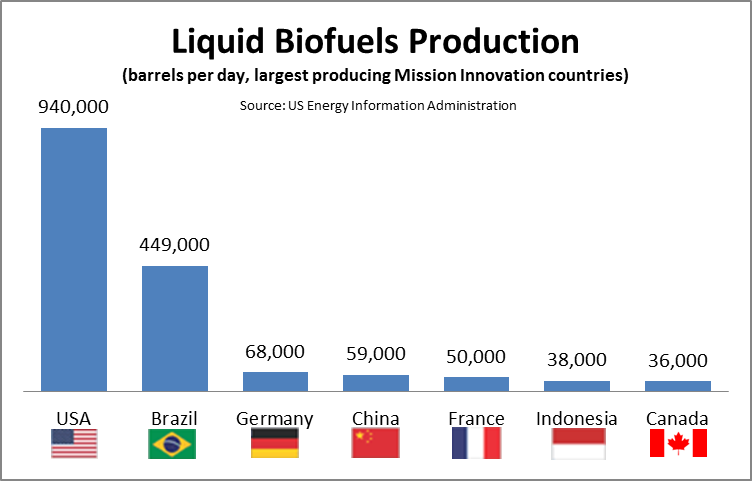 Although sustainable biofuels can have an important role to play in tackling these emissions, many of the most exciting biofuels remain at the pre-commercial stage of development. The Sustainable Biofuels Innovation Challenge aims to accelerate biofuels research, development, and demonstration in order to achieve performance breakthroughs and cost reductions with the potential to substantially lower GHG emissions. Advanced, or second generation, biofuels can be produced from non-food biological materials (biomass) such as forest and farming residues and other waste materials, specially grown high yield plants or algae, and refined into fuels for use in transportation or industry. If managed sustainably, biofuels are a renewable energy resource that can contribute significantly less GHG emissions and other air contaminants than fossil fuels. If climate targets are to be achieved, especially in the short and medium terms, biofuels have an important contribution to make. One role is the use of biofuels when zero-emitting electrification cannot be implemented practically and at a reasonable cost. For some industrial applications which require high operating temperatures and for some forms of transportation – such as long distance shipping and aviation where the added weight of batteries makes electrification impractical – biofuels are the best near term low-carbon renewable alternative to petroleum fuels. A key challenge for some countries constraining wider adoption of biofuels is the limited availability of inexpensive biomass, and the high costs of advanced conversion technologies that are at various stages of development. Research and development aimed at accelerating advanced biofuels availability must address key challenges ranging from the sustainable generation and supply of biological feedstocks which takes into account life-cycle impacts and increasing competition for food, feed and material production, to demonstrating the economic feasibility of technologies to produce biofuels that meet current fuel specifications and that can be blended with existing fuels. The Sustainable Biofuels Challenge Innovation is a key opportunity for governments, researchers and industry to work together on rapidly accelerating research and development, with the goal of achieving performance breakthroughs and cost reductions for large scale production of advanced biofuels. Increased use of biofuels in transportation and industrial applications will contribute to mitigating climate change in key areas of the global economy. With global action, the International Energy Agency (IEA) projects that biofuels could provide around 30% of all transportation fuels by 2050, thereby avoiding around 2.1 gigatonnes of CO2 emission per year compared to continued use of petroleum-derived fuels. In addition to environmental benefits, biofuels can contribute to energy security by diversifying the energy mix and by providing a renewable energy resource. Finally, the Sustainable Biofuels Innovation Challenge provides opportunities to: accelerate adoption of sustainable practices in agriculture, forestry, and land management; take advantage of mitigation and adaptation practices that are synergistic; and multiply opportunities for economic development by growing the market share of advanced biofuels. This Challenge will build on the existing work of individual countries and international institutions, such as the IEA, to identify and prioritise innovation needs and collaboration opportunities where research and development can result in significant advances in biofuel technologies. To achieve this, participating countries will cooperate and collaborate to help governments, private investors, and researchers accelerate technology development so that advanced biofuels reach global market penetration in transportation and industrial applications.